Please contact the farm for further information. Easy vetting and transportation available. The farm is pleased to announce the sale of I’m Thirtynine (Vinny) to J. Ramsey of Louisville, Kentucky. It is absolutely THE perfect match; where Vinny will go on and begin 2019 Eventing. He’s headed to the Ocala Jockey Club for the winter, then back to the sweet Blue Grass state. The 2018 season is quietly coming to an end, and it was a great year for the farm and the horses. Eor The Terrific seems to have graduated from Junior High and has gone straight to Graduate School over the last few months. I can feel a change in him too as I ride. I’ve got a horse who feels confident and forward to the fences. His mental focus has gotten better and he doesn’t become as distracted as when he was a 5 year old. Lou also has stayed his happy-self as our workload has increased and things have become more technical. That is so important to have continue because often horses can do the opposite as the pressure increases to perform. We accomplished a lot for 2018 and had some great wins. I’m as optimistic as ever for 2019. It will continue to be a work in progress; but as long as I love what I do, how can I consider it work? Little Kentucky Farm is over-the-moon happy for Des and his new owner Mary Quarles of Ketchen Place Farm in South Carolina. Mary recently lost her Thoroughbred stallion, and the addition of Des to her breeding shed cushions the loss she feels. Des has an impressive pedigree, with an emphasis of English and Irish blood. His affectionate personality and professional temperament will make for a promising addition to Ketchen Place Farm. 2015 sale prospect, Gran Duque (barn name Des) is another addition to the farm’s sales team. He has excellent potential to go any direction, and qualifies for Young Event Horse and Retired Racehorse Project. Des is a well built youngster, along with an impressive pedigree of Irish and British racing blood. He is Florida bred by Rock Hampton, and has had 13 career starts. More information will be posted in the coming days. We are very proud of our team at Poplar Place Farm March Trials and the 2nd Place finish in Open Training and ANOTHER Thoroughbred Incentive Champion award. Louis is maturing and is turning into quite the Eventing Thoroughbred! We hope to have him running Preliminary level by May. GO Thoroughbred! GO Big Lou! Today’s society where everything and anything is designed for immediate satisfaction, with little to none sweat equity, ask yourself if you have what it takes to develop a young prospect. I’m inclined to believe sweat equity is of bygone days. I’ve noticed in particular over the past 10 years of self-proclaimed experts and Generation X’ers who buy an inexpensive Thoroughbred and then rush through it’s training and completely ruin their chance of becoming a decent riding horse. Then there are those who lack drive, ambition and just plain ol’ horsemanship skills to train a green horse because of their overwhelming need to avoid any physical labor what-so-ever. In the real world its impossible to set a deadline to a horse’s training. How high it should jump, when it can do correct lengthenings or balanced flying changes depends entirely upon each individual horse and rider’s horsemanship. I always start with small goals over a reasonable period of time, and gradually increase the challenges when the horse accomplishes the lessons. I don’t skip steps and over challenge my horses in the early stages of training. For example, mounting off a block while the horse stands immobile, or learning to rein back, walking quietly on the buckle are important lessons I always start with first. They’re small goals that are ingredients for the BIG picture of each horse’s successful future. Training involves developing the horse’s confidence and relaxed mental state. Some horses are naturally relaxed while others will have a more energetic personality. Some horses are described as ‘kick-rides’ , while others are ‘forward rides’. One horse isn’t better than the other, and there are personal preferences for every rider looking for their next partner. Developing and reconditioning an ex-racehorse doesn’t happen over night. Take into account that on average by 1.5 years of age, a Thoroughbred is being broke and goes into race training every day and on the same schedule over and over. They’re sponges and learn through repetition and routine. It comes to no surprise that they learn what to expect when the saddle is on and the girth tightened. . . . it means its time to go to the track and R-U-N.
Once home, the prospect stays active with a lesson of some sort each day. If I tack up, sometimes that’s all I do. I’ll put the saddle on and walk out to the arena and set fences while holding the lead. After fences are set, I may hand graze for a few minutes and then casually go back to the stall and untack. What this does is teach the horse to relax and to do nothing. I’m reconditioning them mentally, and it works. Track horses have an incredible amount of experience that includes loading and traveling to different tracks, racing in daylight or racing at night, loud crowds, mechanical equipment such as hot walkers/ starting gates/ tractors/ golf carts and more. I take that foundation they’ve experienced from the track and build upon those lessons. I never attempt to erase their track experience, but rather build upon them and it makes what I do easier. Sweat equity isn’t for everyone and purchasing a made show horse has it’s advantages. 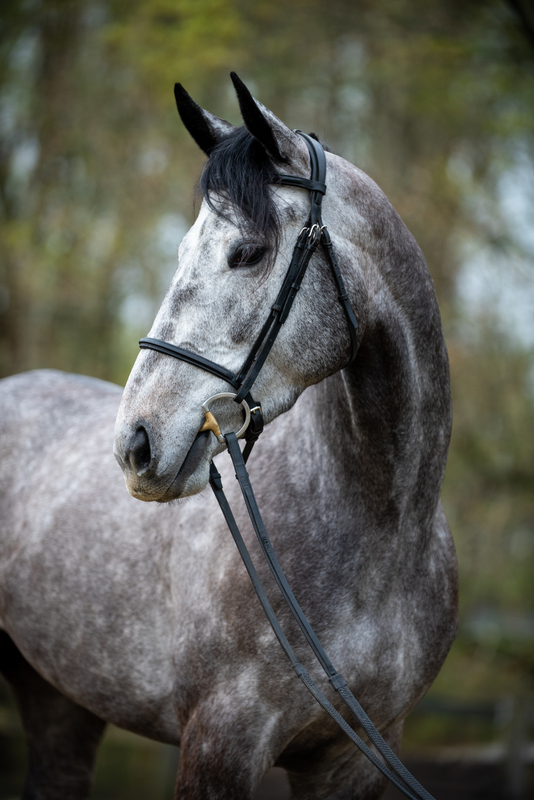 But if you aspire to be a good horseman and devote yourself into training a prospect, it takes a year of steady consistent work when an ex-racehorse begins to understand and show improvement in it’s lessons. They also begin to understand not to associate sounds, loud PA speakers, cantering horses in the warm up, billowing flags on flag poles and electric vibes from other horses with something to react towards. It comes to no surprise to witness so many Veruca Salts walking around in designer breeches. Personally I prefer anyone who resembles Charlie Bucket, who worked hard on his paper route to support his family. GO Thoroughbred . . . GO the Charlie Buckets of the world!